This beautiful country to the north of England has many attractive places to retire. Most Scots probably have good ideas of where they would like to retire in their own country. But even an American, person from the UK, or a member of the Commonwealth who retires to Scotland will be very familiar with place and people names. Another advantage is being able to speak more or less the same language. Edinburgh on the east coast is a cosmopolitan and beautiful city with world class museums, historical sites, and restaurants. It makes for a great place to retire where there is plenty to do. There are many small cities and villages both on the coast and in the countryside that are great places to retire. Scotland will be quite familiar to golfers; some of the world’s great public golf courses are located in these towns. The hiking and biking are exceptional. 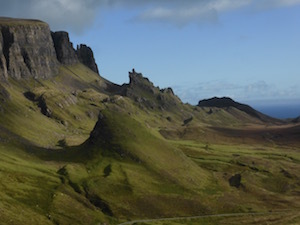 (Photo: The Isle of Skye on Scotand’s west coast). There are many islands that be interesting, if quiet, places to retire. Scotland is wonderful country for retirement for many reasons. There is great beauty and millennia of history everywhere. Restaurants deliver top notch food, the pubs are fun - and did we mention the whiskey? The people are friendly and the economy is strong. No one can be a stranger too long in Scotland. Establishing residency and visa. Establishing residency in Scotland is not as difficult as some countries, depending on your nationality. It is relatively easy for residents of Great Britain, the Commonwealth, and the European Union to retire in Scotland. Even if that is not your case, you can apply for a 5 year residency permit as Retiree with Independent Means. You can also qualify for a “permission to remain” residency. Here is the link to the Extension Form. You must be able to able to prove that you can support yourself, and successfully pass a personal history questionnaire. There is a substantial fee for that extension, £3672 for 1 person and a dependent. You can always apply for a standard visa that normally allows you to live in the UK (Scotland is still part of the UK) for up to 6 months. Here is a link to the UK Immigration Service. Scotland has an active independence movement. Although the 2015 vote did not pass, many young people believe that the country will exit the United Kingdom the next time a vote is held. Medical. Modern medical facilities and highly skilled medical practitioners are available in Scotland, but due to high demand, access to medical specialists and admissions to hospitals for certain non-life-threatening medical conditions may result in extensive waiting lists. Residents of the UK and the European Economic Area are generally entitled to free medical care for most services. Some other countries have reciprocal agreements and they do not have to pay. If you are from some other country do not assume your medical insurance will be valid in Scotland (Medicare is not accepted here). You should consider buying health insurance, possibly as part of your travel insurance package. Crime and Security. The U.S. State Department reports that: "The United Kingdom is politically stable and has a modern infrastructure, but shares with the rest of the world an elevated threat of terrorist incidents of international origin, as well as the potential for isolated violence." Taxes. Residence status for Scottish tax purposes is controlled by the number of days you are present in Scotland during a given tax year. You will be considered a resident if you spend more than 183 days in a tax year. There is a complicated distinction between "Resident" and "Ordinarily resident". There is also a distincition between domicile vs. Residence. You should consult a tax professional if you decide to reside here to determine how the laws apply to you. Cost of Living. The numbeo.com price comparison (CPI plus rent) shows the entire United Kingdom with an index of 61, vs. the U.S. with 60. The site estimates that it is 22% cheaper to live in Edinburgh than it is in New York City. The price of real estate in Edinburgh is about one fourth the New York price and rents about one third. Weather. Scotland has better weather than you might think. The pattern of rain is fairly even over the year. Most months see a little over 2 (inches, or 11 centimeters), but it does not get particuarly cold. January temps are about the same as in Paris, but will be as much as 5 degrees (C.) cooler in summer than the City of Light. Locals play golf and hike throughout the year. Best Places to Live. Scotland has many nice villages, towns, and cities to retire in. The coastal areas are especially beautiful. St. Andrews is an ancient coast al town with a very old golf course and the Royal and Ancient Golf Club, home to many British Opens. See the list of Scottish towns which we have reviewed in the top right column. Pluses and Minuses. The lifestyle is very attractive as the country is filled with lively people who enjoy life. The scenery is great as is village life. The people are very friendly and enjoy a healthy lifestyle.